I have another fun card to share with you. I paired a few of my favourite products from the new MFT Release and the new Sketch Challenge. 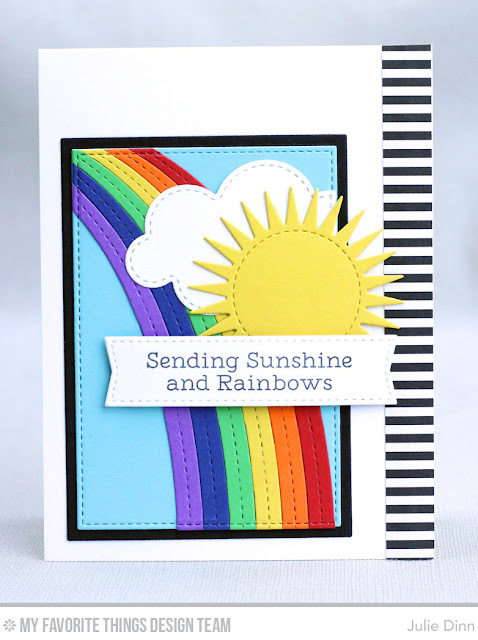 I seriously can't stop using the End of the Rainbow Die-namics and Rainbow Greetings stamp set! The colourful rainbow was adhered to the Summer Splash card stock and then it was die-cut with the Stitched Rectangle Die-namics. The sun was die-cut with the Radiant Sun Die-namics. A few touches of black finished off the card. Lovely rainbow and sunshine for a perfect card!